Home > Computer > What is Blue-Ray and HD-DVD? If you remember the VHS vs. Betamax wars of the early 1980s then you’d have thought that the manufacturers would have come together to make sure that the same thing doesn’t happen again however as a consumer you’re soon going to have to make a similar choice and hope that your decision is the right one. The reason is that the standard DVD is going to be replaced over the next few years with high-definition versions. Sadly there isn’t just one disc to choose from as two groups are looking for supremacy in the market place. These are HD-DVD and Blue-Ray. To look at the discs are exactly the same in-fact apart form the technology used to read and write information to the discs they are identical in size and shape. They’re even the same as DVDs you’ll already be familiar with. Blue-Ray gets its name from the blue-laser that’s needed to write and read data from the disc. 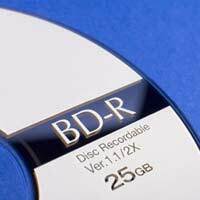 A dual layer Blue-Ray disc can hold up to 50GB of information but there is the potential that discs will increase in capacity to as much as 250GB in the future. A 50Gb Blue-Ray disc can hold up to 9 hours of high-definition video footage. Blue-Ray equipment is becoming more and more popular but it’s still very expensive and only for those who simply have to have the latest equipment. A number of movie studios and manufacturers have signed-up to the standard and there should be plenty of kit and movies available in short order. HD-DVD is similar to Blue-Ray but is being pushed by a different consortium of manufacturers and movie studios. The capacity of the HD-DVD disc is less than that of Blue-Ray at 30GB but it’s still plenty of storage for video and data. In other respects the discs differ slightly but to the end users there’s not much to tell between them. HD-DVD equipment is similar to Blue-Ray in that it’s beginning to take hold though it remains very expensive. Luckily for you there are some manufacturers that are making players that will be able to use both disc types. Obviously these are even more expensive than the single player types but will offer you the most flexibility in the future. The overall decision to go for HD-DVD or Blue-Ray is a bit of a gamble. There’s no indication at the moment as to which one off the two formats will win out. There’s no guarantee either that one or other of these formats will outdo the other one. The problem with that is that the movie makers supporting Blue-Ray will only release movies on that format and vice versa so you might have to buy both types of player to buy all the moves released. Hopefully one or other of the formats will win out or the manufacturers will come together to ensure that the consumers aren’t forced into making a choice between the two types of disc. We can only hope. Whatever the outcome both disks give amazing image quality and are an improvement over current technologies.